The Marcellus Library has books, electronic resources, meeting space, and reference materials. But as a vital part of a lively community, the library also has times of noise, music, laughter, dancing, shrieking, braying and eating. In 2017 the library hosted 37 special programs and 40 hours of pre-school stories and activities. These activities were attended by 2,219 persons. 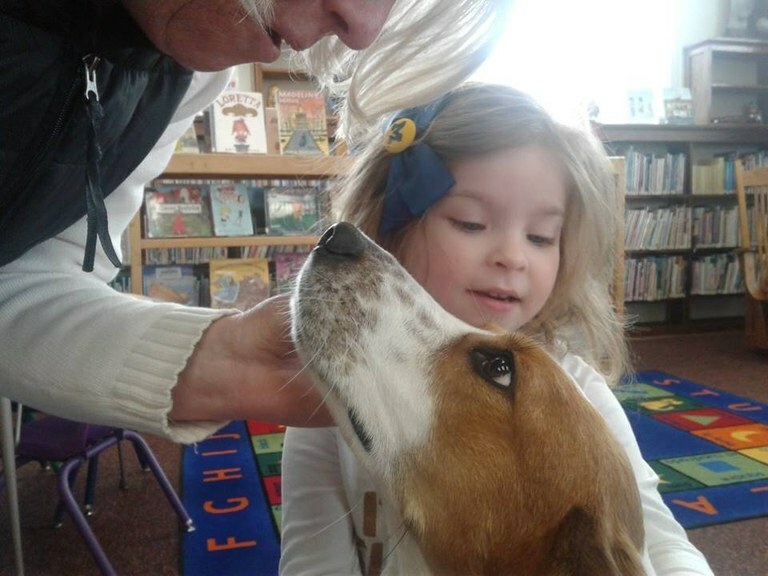 Two young library patrons, both named Kara, declared during Bluegill Frolic days that their favorite library memories are of Reptile Day (Muxalow Exotics) in 2017 and Farm Day in 2018. On Farm Day Hidden Acres Petting Farm brought small farm animals and fowl to the yard outside the library. Many children sat in the baby goat pen, carried chickens in their arms, fed a donkey, and milked a very patient goat. Reflecting that, at a library, we have the world at our fingertips, Nofsinger pointed out that “Over the past few years we’ve learned about all the counties in Michigan and the many good vacation spots across the state. We learned about the life and culture of Amish and Mennonites and Al Capone, all of whom have a history in southwest Michigan. We heard fascinating stories of shipwrecks on the Great Lakes, about life in Spain, Qatar, Laos, Congo and Costa Rica. We heard from a lot of authors, and the Gilmore Car Museum came to see us. So did the Kalamazoo Air Zoo, the Kalamazoo Nature Center and the circus! We learned about invasive species, scuba diving, small business set-ups on ebay, and how to overcome addictions. Oh, and that tattoo program . . . amazing. Occasionally we went out of town—like those awesome bus trips to the American Girl Museum and the Magnificent Mile in Chicago! “We offered so many classes: crochet, French conversation, knitting, bike repair, yoga, martial arts, dance, jewelry making, sand art, Pysanka egg painting, dog training, essential oils, watercolor and acrylic painting, adult coloring, beer brewing and first aid. “And oh, how we played! We hosted family game night and played Legos. We threw beach parties in January and superhero parties in July. We traipsed through town on treasure hunts and scared the trick-or-treaters (and their parents—biggest thrill of all) at our Haunted Library. Every December Santa came to town and so did the Easter Bunny! We celebrated the library’s 120th birthday and National Poetry Month. We had tea parties and heard some pretty awful karaoke. We watched good movies and also some really bad ones. We watched the solar eclipse together. And who could forget our Captain Underpants themed float in the Bluegill Frolic parade, when the staff walked down the street wearing tighty whities and continued the celebration with an Underwear Fling and plunger war at the library. The library hosts two regular book clubs for adults and occasional book clubs for youth. A highlight for Irene Walewya Goodlow was the visit of author John Kozak, who came to visit the library after the book club she attends read his book Through the Eyes of Rose. On Wednesday mornings the library “comes to life” as pre-schoolers and their care-givers bounce in for an hour of stories, music, movement, healthy snacks, and creative craft projects designed by the library’s in-house artist, Joy Kozik. Check out the story hour photos and commentary on the Marcellus Library Facebook page!